Will temperatures get cold enough to snow at the higher elevations? The atmospheric river we are experiencing is warm & wet to around 11,000' with strong Southwest winds. The most worrisome avalanche problem for the BWRA is the likelihood of large destructive Wet Slab avalanches, especially on leeward aspects N-NE-E (R3D4). Expect steep terrain to be shedding snow off of the mountains & not so much collecting it. 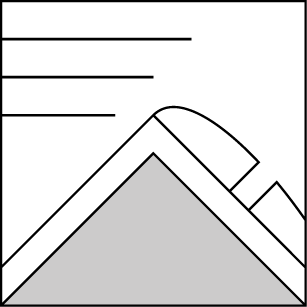 The avalanche hazard comes with plenty of problems, unless you are absolutely sure of your surroundings, travel in avalanche terrain is not recommended. The most destructive problem at the moment is the likelihood of large Wet Slab avalanches! The snowpack in leeward drainage features on N-NE-E aspects, near treeline, could be around 300cm deep. Taking on this massive deluge of rain, the snowpack will become saturated until it cannot hold together any longer. Gravity will overcome the shear strength of the snowpack creating large Wet Slab avalanches, some could be Deep. If enough rain falls, could full depth Glide avalanches be seen...? Looking outside, there is no doubt that the mountains are shedding Loose Wet avalanches. 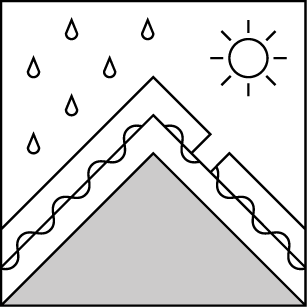 Lubricated snow grains have poor cohesion & cannot resist gravity, therefore they slump off anything with a steep enough slope. Yesterday we saw plenty of Loose wet activity, some slides incorporated mud & rocks. Expect snow to be perfect for post-holing & getting your snowmobile stuck, there is no support. This is the unknown? Will it get cold enough to snow at higher elevations? If we get the 4-10" of possible accumulations we could see moderate sized Wind Slab develop on N-NE-E aspect above treeline. The winds will accompany this system with voracious force nonetheless. Trees will be damaged with the strong Southwest winds. Surprising depths of around 300cm still exist in isolated areas on N-NE-E aspects. These thick wind deposits in leeward drainage features are to be avoided for the next few days as they contain potential Deep Slab Avalanches. As we collect torrential rains within the snowpack expect to see natural avalanches that could reach R3D4 in size & destruction. Human triggered avalanches will be very likely if not certain on such terrain below, near & above treeline. Runnels & shmooing Loose wet slides will be all across the ladscape today. Travel is not recommended on any steep terrain above 30 degrees, or any areas where avalanches could increase consequences. We scouted for the avalanche remnants from the cycle post 3/22 & found plenty of large wind slab avalanches. A very wet afternoon yesterday with sideways rain & 38F degrees at 9K'. The snow was super saturated with Loose wet & Wet Slab avalanches seen through the clouds around Sardine Falls. Debris including mud & rocks were entrained in several of the wet avalanches. 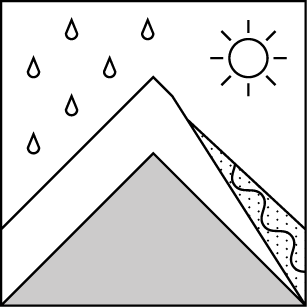 The percolation of rain water has likely run through the snowpack & onto the surface soils in some areas. Could we see a Glide Avalanche? 0600 temperature: 46 deg. F.
Max. temperature in the last 24 hours: 46 deg. F.
Rain in overwhelming amounts is impacting our area. Elevations around 11,000' will experience warmth, rain & strong SW winds. Snow is possible above treeline as temperatures decrease later today. The AR could deposit another 1-1.5" of water or 4-10" of snow depending on the systems development. Temperatures: 43 to 49 deg. F. 23 to 28 deg. F. 47 to 55 deg. F.
Temperatures: 37 to 42 deg. F. 19 to 24 deg. F. 42 to 47 deg. F.
Expected snowfall: 4 to 10 in. 0 in. 0 in.